A recent report published by Infinium Global Research on tire cord and tire fabrics market provides an in-depth analysis of segments and sub-segments in the global as well as regional tire cord and tire fabrics market. 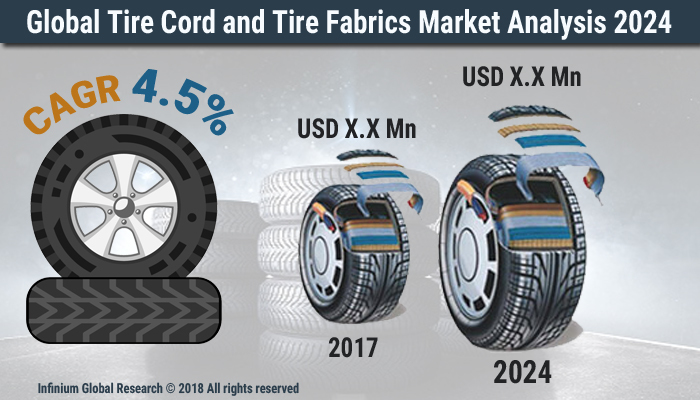 The study also highlights the impact of drivers, restraints, and macro indicators on the global and regional tire cord and tire fabrics market over the short term as well as long term. The report is a comprehensive presentation of trends, forecast and dollar values of global tire cord and tire fabrics market. According to the report, the global tire cord and tire fabrics market is projected to grow at a CAGR of 4.5% over the forecast period of 2018-2024. Tire cord fabrics are designed to retain tires in shape as well as it supports vehicle weight that has a significant impact on the performance of a tire. The tire cord fabrics are available in different types such as Nylon tire cord fabrics (NTCF); Polyester tire cords fabrics (PTCF), chafer fabrics, and cycle tire cord fabrics. Further, the tire cord fabric can be comprised of two types one of them is warp cords that are oriented in the longitudinal direction while another one is weft yarns that are oriented in the lateral direction. Polyester tire cord gives high dimensional stability, excellent heat resistance, few flat spots, and controllability. This is mainly used in radial tires for passenger cars while hybrid tire cord made by combining more than two materials used in premium tires that gives optimal performance. Rising demand for degradable tire materials drives the growth of tire cord and tire fabrics market. As the degradable cords and tires are strong as compared with the synthetic ones the demand for consumption has increased in the manufacturing industry. They can also be reused. Furthermore, growth in the sales of automobiles owing to stability, effectiveness, and variety of materials that are used in the automotive tires fuels the growth of tire cord and tire fabrics market. Moreover, rising awareness for biodegradable products to reduce pollution boosts the growth of tire cord and tire fabrics market. However, low demand for automobiles in some countries owing to economic slowdown hampers the growth of tire cord and tire fabrics market. Rising demand for bio based and environmentally sustainable alternatives to traditional tire cord materials are providing beneficial opportunities for tire cord and tire fabrics market. Among the geographies, Asia Pacific dominates the tire cord and tire fabrics market followed by North America. The growth in the Asia Pacific region is due to the high demand in automotive sales for personal vehicles as well as commercial vehicles in the region. The upsurge in the middle-class population in China and India has extensively contributed in the soaring demand for a car in the Asia Pacific region. Increasing middle-class population, predominantly in China and India, have encouraged European and American car manufactures including Mercedes-Benz, Audi, and BMW to enter the Asian market with small cars, designed specially to meet the requirements of this region. Specific types of tire cord and tire fabric materials are used in specific regions such as polyester tire cords are highly used in North America and Europe. The sales of the automobiles in the North American region is anticipated to reach 10-12 million units at the end of 2024. Moreover, In North America and Europe, region rate of radicalization of tires is increasing rapidly that in turn is fuelling the growth of tire cord and tire fabrics market in these regions. The report on global tire cord and tire fabrics market covers segments such as vehicle type, application, and product. On the basis of vehicle type, the sub-markets include off-road vehicles, light commercial vehicles, bicycles, two-wheelers, personal vehicles, and others. On the basis of application, the sub-markets include bias tire, radial tire, and others. On the basis of product, the sub-markets include polyester, nylon dipped, rayon, steel, and others. The report provides regional analysis covering geographies such as North America, Europe, Asia-Pacific, and Rest of the World. In this section, the key trends and market size for each geography are provided over the period of 2016-2024. The countries covered in the North America region include the U.S., Canada, and Mexico while Asia-Pacific includes China, Japan, India, South Korea, Malaysia, and among others. Moreover, Germany, U.K., France, Spain, and Rest of Europe are included in the European region. The U.S. drives the growth in the North America region as it is the largest market in this region. The Asia-pacific region offers substantial potential for the market growth owing to rapid growth in markets such as India and China. The report provides profiles of the companies in the market such as HYOSUNG Corporation, Kolon Industries, Inc., Tokusen Inc, KORDÁRNA Plus AS, Kordsa Teknik Tekstil A.Ş., Firestone Fibers & Textiles Company, SRF Limited, FORMOSA TAFFETA CO.,LTD, Century Enka Limited., and Shandong Helon Polytex Chemical Fibre Co.,Ltd. . The report provides deep insights into the demand forecasts, market trends, and micro and macro indicators. In addition, this report provides insights into the factors that are driving and restraining the growth in this market. Moreover, The IGR-Growth Matrix analysis given in the report brings an insight into the investment areas that existing or new market players can consider. The report provides insights into the market using analytical tools such as Porter's five forces analysis and DRO analysis of tire cord and tire fabrics market. Moreover, the study highlights current market trends and provides forecast from 2018-2024. We also have highlighted future trends in the market that will affect the demand during the forecast period. Moreover, the competitive analysis given in each regional market brings an insight into the market share of the leading players.